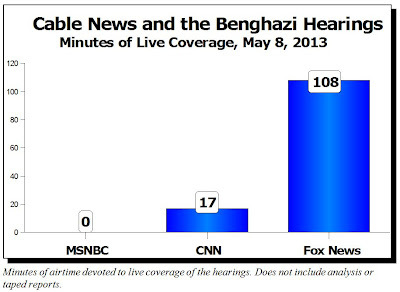 On May 8th as the House committee hearing about the Benghazi attack occurred, you could have tuned through every major network with the notable exception of Fox News and (a) not found any coverage or (b) found so little coverage that you would not even have known it was occurring. Even C-SPAN dropped the ball, devoting that time period to the blathering in the Senate. I am an independent, who voted Democratic in every Presidential election from 1976 through 2004. In my judgment, the main crime was the lying to America by Obama and his minions (that is the only word that fits such a characterless crew), for weeks after the incident (and ongoing, in fact). So to have Reeves write, "We already knew an anti-Islam movie did not inspire the attack" is an outrage, and requires any competent, and honorable, person to demand -- over and over, damn it -- "then why did you let Obama get away with lying about it for so long? You are complicit in a treasonous coverup THAT IS STILL GOING ON, as well evidenced by the obvious, and determined, lack of concern shown by your words -- you obviously have as little character as that self-serving hack of a Secretary of State who said, 'what does it matter? '", or that self-serving, self-inflated hack of a President, whose every statement has been and continues to be a lie (and a near absolute refusal to even name Islamic terrorism as a dedicated enemy of our way of life) to the people he is pledged to serve." The crimes -- not only of Obama and of those who serve him, but all those who voted for him, largely out of uncontrolled feelings of revenge toward the Republicans -- are too outrageous for them to admit any part of them. And therein lies the tragedy for America. History will judge them, "they did not respect what they had, nor those who procured it for them." Alan, you nailed it with this one...so many good points made. Glad you mentioned those paying attention. Sadly, too many still are not! The U.S. Justice Department secretly obtained two months of telephone records of reporters and editors for the Associated Press in what the news cooperative's top executive called a "massive and unprecedented intrusion" into how news organizations gather the news. And the MSM still want to defend this Bozo?